If you're in the process of selling your home, you already know to list it online and advertise it locally. But could you be missing out on one of the most powerful ways to market your property: your social networks? After listing your home with MilitaryByOwner, pushing your home ad across your social media networks is an important step, whether you're listing with an agent or doing a For Sale By Owner. Follow along for some tips about leveraging the power of social media for your home sale. Military families are constantly on the move and often ask friends for recommendations for where to live at their new location. Though you may feel silly putting your home ad on your personal Facebook or Twitter, go ahead! Even if your friends aren't currently looking for a home, they may know someone who is and can refer them to you. We live in a visual age, and the power of good images can't be understated. When creating your ad online, make it shareable through the interest created from good photos. Blurry, poorly lit photos will cause prospective buyers to scroll on by, while good quality, clear photos could inspire a buyer to find out more. Do a Facebook Live video or upload a video tour of your home--just be sure to set it to 'public' and ask your friends to share. Publicize your Open House across your social media. If you have your own Facebook page, YouTube channel, or blog, mention it there. 3) Research platforms and plan accordingly. In the post Use the Power of Social Media to Sell Your Home, we're reminded it's important to know where to best share, along with what. You may have good results posting in local Facebook neighborhood or military oriented groups (ask for permission from admins first), but posting on Twitter and LinkedIn can be effective, too. Social Media Site: Twitter, Facebook, Pinterest, Instagram, LinkedIn, etc. Forums: Links to local spouses' pages, base housing pages. After one week, count the number of interactions on your posts to see where you’re gaining traction and what you may need to tweak in order to boost views and engagement. 4) Respond to all messages and comments in a professional way. Even if the person commenting isn't truly interested in buying or renting your home, others will see how you respond and may determine from the online interaction whether you're someone they'd want to work with or recommend to others. Again, remember it's all about social networking! 5) Remember that social media is part of a multi-pronged marketing approach. Social media will only amplify your existing home ad, open houses, and other tools for listing your home. Selling a home can be a process that takes patience, but MilitaryByOwner is here to help! 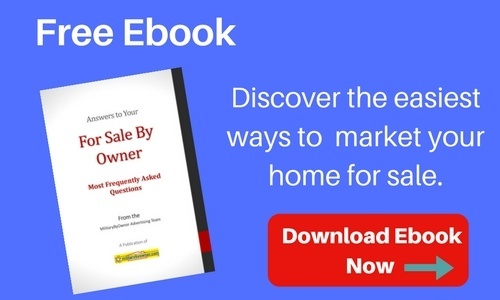 For more ideas to best market your home, download our newest ebook.